Much of our knowledge of plant—herbivore interactions are based on results from experiments applying mechanical damage to plants. However, in recent years, the use of simulated herbivory has been criticized and several problems identified. 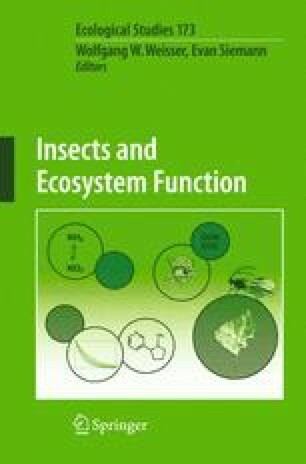 The aim of this chapter is therefore to identify the most obvious advantages and disadvantages of using simulated insect herbivory and suggest ways to avoid some of the problems or alternative ways to conduct the experiments, e.g. by using natural herbivores caged on specific plant parts (clip cages). It is clear from the literature that simulated herbivory often fails to induce plant responses that are important for complex biotic interaction, e.g. interactions between plants, different insect herbivore species and their predators/parasites. This strongly suggests that if the aim of a study is to identify and understand the ecological role of these complex interactions and ecosystem processes we need to use natural herbivory. Simulated herbivory may, however, still be an appropriate method for investigating simple biotic interactions, e.g. the effects of herbivory on plant growth and survival or physiological processes in plants that deter or limit further herbivory by the same herbivore. Simulated herbivory might also be a useful tool for dissecting damage into its functional parts, i.e. mechanical wounding and elicitor application. The study of more complex biotic interactions, e.g. plant-mediated competition or interactions involving a third tropic level, requires the activity of real herbivores. Nevertheless, we should be aware that even the use of natural herbivory is associated with potential problems, e.g. clip cages can reduce radiation, increase leaf temperature, reduce leaf expansion and restrict realistic interactions with predators and parasites, and this should be taken into account when designing experiments and interpreting results.